But how do I cap my 60 mL syringes? The second and third syringes in the image above are capped with the caps from feeding sets – the second syringe has the cap from the legacy feeding sets (red tip) and the third syringe has a cap from the EnFit feeding sets. Legacy caps fit much better on the syringes I own, and the EnFit ones are kind of loose, but they still work. This is a pretty simple solution for those who use both a feeding pump AND 60 mL syringes. This seems obvious, but a shocking number of 60 mL syringes do NOT come with caps. If you get syringes from your DME, ask them if they have any available with a cap. If you buy syringes on your own, look for ones with a cap. Alternatively, as mentioned below, The Squirrel Store sells caps that fit on the Miracle Syringes they (and others) sell. The two syringes to the right of the image above are two different types of syringes we’ve gotten from two different DMEs that both came with caps. Wondering where to get syringes? I strongly prefer O Ring syringes over rubber-tip syringes. They have SUCH a long life. We’ve been using the same 5 O ring syringes for 6 years now. Rubber tip syringes tend to last us a few days max before the rubber starts sticking really bad, and then we have to baby them along with olive oil for continued function – not exactly easy to use on the go! If you weren’t already aware, some people are into squirrel rehabilitation, and those people evidently use 60 mL O ring syringes. So, some of the best places to buy O ring 60 mL syringes are squirrel rehab stores like The Squirrel Store and Chris’s Squirrels and More. The “Miracle” Syringe sold by these stores does not come with a cap, but The Squirrel Store sells caps that will fit on the tips of the 60 mL syringes. Author wallypopPosted on April 2, 2019 April 2, 2019 Categories How To/Tutorial, Special/Medical NeedsLeave a comment on But how do I cap my 60 mL syringes? Oh no! You’re having a medical emergency! What to do? Quick, hit up Pinterest, look for this pin, which you’ve of course saved, read it over fast, and pack up!! No, I’m kidding. I mean, obviously. This post is meant to be more of a jumping-off point for your own strategy of pre-packed bag and last-minute grab list. Having a reasonably decent amount of stuff to face a few (or many, many) hours in the ER really does rely on some advance planning. Plan NOW so you don’t have to panic later! 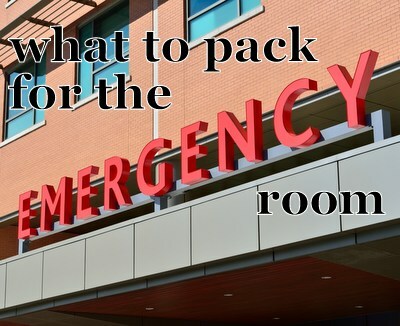 Note also that when I say “emergency room” I actually mean “emergency room, with the potential of being admitted.” By this, I mean that I bring enough stuff to last me about a day and a half to two days, which is about the longest I anticipate having to go before someone can bring me more stuff, such as my hospital suitcase. Things that are always packed. I use a series of small storage bags for this (the medium wet bags from this page), which are then thrown together into my tote bag that I bring to the emergency room. Feeding supplies for 36-48 hours. We use a combination of Real Food Blends and home blenderized meals in our daily life, and I pack only Real Food Blends in this bag. His feeding pump and charger (I have a spare charger and an old pump that doesn’t hold a charge). Feeding sets and extensions. If you have an oral eating child, pack shelf stable preferred foods. Medication supplies. I can’t pack the actual meds, but I have a small bag with various sizes of syringes and an extension (I don’t use the same extension for meds as I do for food) that I store in the feeding supplies bag. Mom Survival. I keep a small bag with a water bottle and some of my special chocolates, as well as some advil and enough menstrual pads for about 2 days. Because murphy’s law dictates that I’ll start my period a week early if we’re in the ER. Extra socks. Hospitals are gross. Your list will vary here, but this should help you get started! Meds. Pre-drawn for 2 days worth if possible, otherwise, I just toss the bottles in a ziplock. DVDs. Our ER has a DVD player. They do have movies you can ask for, but if the ER is busy, getting you a movie is very low on the list, so I bring our own. I store our current favorites in a carry case anyway, because… I just do, I guess. So I just grab the case. Current favorite toys and old favorite stuffed animals. I carry a backpack most places. I leave it in the car nowadays, but I still bring it with me when I leave the house. That’s where these things live, and then the “pack last minute” things also go in here. Collapsible cup. Every mom should carry one. We use ours all the time. Toothbrush, toothpaste, and tiny deodorant. I sweat when I’m anxious and most of our ER trips are urgent and in the middle of the night. I’m better at humaning when I’m not keenly aware of my dragon breath. You may wonder why I don’t just keep these in the “Packed all the time” section? I find myself absentmindedly forgetting things like deodorant sometimes, and I have used that toothbrush actually quite a bit. Crayons and a coloring book. Pens, pencils, and a small notebook. Playing Cards and Go Fish Cards. Teddy’s Vogmask. Hospitals are gross. Spare battery, charging cables, and one dual wall charger. Are you thinking “this woman has an unhealthy obsession with charging cables?” That may be true. I usually have more than I need. If we do ER to transport to admission, for example, I have the cables from my backpack, the ones from my ER bag, and the ones in my suitcase. Whatever. I’d rather have too many than not enough. And, plus, I get to be that mom who has the extra cable. You know. The one who gets to help that dad who was on his weekend with his daughter when she suddenly became ill and a day later, she has a diagnosis of type 1 diabetes and they find themselves hours away from home facing at least several days inpatient and his phone’s on 5% and he didn’t bring a charger to the ER in his hometown yesterday. True story, and not the only time I’ve lent a charger to a fellow hospital parent. Yes, hospitals often have charging stations now, and that’s GREAT. But you really need a charging station in the room with you if you’re alone with your child. I keep a pair of comfy gym-type pants and a comfy, seasonally-appropriate shirt in a special spot in my dresser. I throw these on in an emergency and grab a hoodie from the hook where I keep hoodies. These clothes are actual clothes – I look like I’m dressed. They’re also comfortable for sleeping, so if we’re there overnight, or if I want to snuggle up in the bed with Tbear, or whatever… I’m also comfortable. Now, what if the emergency is such that there just isn’t time to grab ANY of this? Well, I at least have the things in my “Always have with me” list, because I can’t imagine any emergency that I don’t grab the backpack. And because we can’t go without Teddy’s meds, and our local hospitals don’t have his most important ones readily available, someone will simply HAVE to bring them to me at the hospital. Keeping my ER things in established places (in the closet where I store medical things, or in my dresser) means that anybody can find them. Don’t you hate Tutorials without picture?? Sorry. Simple messenger bags are pretty easy to make. Perfect for a last-minute gift for anyone on your list this year. 1. Decide what size you want. Let’s say you want a bag that’s 12 inches by 24 inches and 2 inches wide. 2. Cut out pieces. A front, a back, a flap, and a strip for the width. Flap: I chose to cut mine the same size as the front and back. You may go shorter or longer. You may opt to shape it as a rectangle, or to angle the edges in a bit, or to make it a half circle. You’ll need to cut the whole bag out of both your main fabric as well as your lining fabric. If you chose to use interfacing, cut the bag out of that, too, and iron or sew the interfacing to your lining fabric. 3. There are several ways to go about assembling the bag at this point. These directions will give you just one option. 4. Using a 1/2 inch seam allowance, sew the two fronts together, right sides facing, along the top edge. Turn right sides out and iron the seam flat. Topstitch if desired. Baste around three unfinished edges. 5. Sew the two strips together, right sides facing, along the two short edges. Turn right sides out and iron the seam flat. Topstitch if desired. Baste along two long edges. 6. Sew the two flaps together, right sides facing, along three sides, leaving one long edge open. Turn right sides out and iron the seam flat. Topstitch if desired. Baste along open edge. 7. With wrong sides together, baste two back pieces together along all four edges. 8. Pin and then sew strip along the sides and bottom of front piece, right sides together. Clip strip at corners to enable smooth turning. Repeat with back piece. Turn right sides out. 9. You now have a little bag that just needs a flap and strap! 10. Sew flap to back, right sides together. 11. Finish all exposed seams however you desire – overcast, pinking shears, seam binding, etc. 13. If you desire to fasten the flap, assemble and attach whatever you have chosen as a fastener.